Nga Haerenga (the New Zealand Cycle Trail) is a national network of cycle trails created by the government, together with local bodies. The trails offer unique off-road experiences to travellers of all ages and levels of fitness to explore the real New Zealand that exists beyond the highways and byways. The trails take in places of cultural and historical significance, offering immersion into the natural landscapes of lakes, rivers, mountains, and forests. Visitors can combine road with water transport, and choose from short or multi-day rides using their own or hired bicycles. Some trails are recently opened, others yet to be fully complete. The Hauraki Rail Trail showcases beautiful scenery and pioneering history as it traverses farmland and the majestic Karangahake Gorge, following an old rail line from Thames to Waihi. At Waikino, riders can take the option of boarding a vintage train to complete the journey. The Hauraki Rail Trail showcases beautiful scenery and pioneering history as it crosses farmland and the majestic Karangake Gorge, following an old rail line from Thames to Waihi. At Waikino riders can take the option of boarding a vintage train to complete the journey. The Hawke’s Bay Trails meander between over 180 kilometres of well-formed, mostly-flat trails, linking the twin cities of Napier and Hastings with three distinctly different cycling experiences. Take in coastal communities, vineyards, and estuary views. The Motu Trails offer cycling itineraries for all ages, fitness levels, and riding abilities. From the easy Dunes Trail, to forested conservation areas, and advanced mountain biking through native forest, riders experience beautiful Opotiki and Ohiwa, where a new estuary ride from the beachfront Ohiwa campground has just been completed. The Mountains to Sea Cycle Trail combines mountain biking trails, public roads, and a jet boat experience, linking the mountains of the Central Volcanic Plateau to the sea in Whanganui. Riders traverse two national parks through an area of rich cultural heritage with stunning scenery. The Rimutaka Cycle Trail, from Petone to Ocean Beach, begins at the head of Wellington Harbour before circumnavigating the bush-clad Rimutaka Ranges, passing through tunnels on an old rail trail, and skirting the wild southern coast. The varying grades of each region will suit a variety of riders. Te Ara Ahi – the Thermal by Bike Trail offers 66 kilometres of breathtaking trails through thermal wonderlands of bubbling mud pools and spectacular geysers. Experience rare flora and fauna and regions of great cultural significance as you wend your way through trails adjacent to some of the country’s most-visited tourism attractions. The ancient forests of the Timber Trail follow old tramlines, suspension bridges, and 87 kilometres of specially-designed track, from Pureora Forest Village across the middle of the North Island. The trail can be accessed from a variety of different start points all within easy region of Auckland, Hamilton, Rotorua, Taupo, and Wellington. The Twin Coast Cycle Trail – Pou Herenga Tai – is located in the Far North in an area of significant Mãori and early-European history. The route partially follows ancient Mãori trails marked with decorative pou (hand-carved posts) and rail trails, as it passes from the east to west coast, providing stunning vistas over the Hokianga Harbour and Bay of Islands. The Waikato River Trails follow New Zealand’s longest river through native and exotic forests, and across wetlands, past historic landmarks, and volcanic rock formations. The trails offer striking lake and river views as they meander past towering dams and suspension bridges and across long, meandering boardwalks. When it is fully completed, Southland’s Around the Mountains Trail will allow cyclists an opportunity to explore and discover some of New Zealand’s most secluded and rustic rural settings at a relaxed pace. Visitors will be transported back in time in the many historic townships of heartland New Zealand. The Clutha Gold Trail offers a unique heritage experience, showcasing the area’s history of early Mãori moa hunters, Chinese gold miners, and European pastoral farming, mining, and rail travel as it follows the mighty Clutha Mata-Au River. The trail links to the famous Otago Central Rail Trail at Alexandra. The Dun Mountain Trail is an exciting one-day ride to and from Nelson on New Zealand’s first railway line, offering views across the Waimea Plains, Nelson, and beyond to Tasman Bay and Abel Tasman National Park. From the mountain tops near Windy Point and Coppermine Saddle the downhill mountain ride is New Zealand’s longest. Tasman’s Great Taste Trail begins at either Nelson Airport or Nelson i-SITE before travelling over boardwalks along the edge of the Waimea Estuary bird sanctuary, across to Rabbit Island and on to Kaiteriteri, the gateway to the Abel Tasman National Park. The full loop of 165 kilometres takes riders through vineyards and past cafes and a variety of accommodation options. The Otago Central Rail Trail was named after the original railway line, built between 1891 and 1907. New Zealand’s first rail trail, it was first opened to the public in 2000, paving the way for the nationwide network which has now been created. The Rail Trail offers a 150-kilometre scenic and historic journey past 20 townships in the Central Otago heartland. Ride through the heart of the Marlborough Sounds on a 70-kilometre journey from Ship Cove to Anakiwa, through lush coastal forest, around historic bays, and along skyline ridges. Ride the entire track or sections of your choice, using either road access or boat transport from Picton. An exciting recent addition to Central Otago’s existing trail network, the partially complete Roxburgh Gorge Trail traverses a remote Central Otago between Alexandra and the Roxburgh Dam, following the Clutha Mata-Au River. The St James Cycle Trail is the first of the Great Rides. It passes through the iconic St James Station, near the alpine spa village of Hanmer Springs, taking in 64 kilometres of mixed-grade trails. This trail showcases mountain peaks, rivers, high-country lakes, alpine meadows, sub-alpine beech forest, and expansive grassy river flats. A new family-friendly 15-kilometre ride, called the Homestead Loop, was recently opened. The loop starts from the end of the St James Cycle Trail at St James Station Homestead. Ride past mining relics of a bygone era, through picturesque native forest to alpine tops offering breathtaking views and river valleys with lakes and tarns. This partially-completed trail links Seddonville, Mokihinui Gorge, and Goat Creek. The southern end provides a stunning ride from Lyell in the Buller Gorge, through native forest and over the Lyell Tops to Ghost Lake Hut. 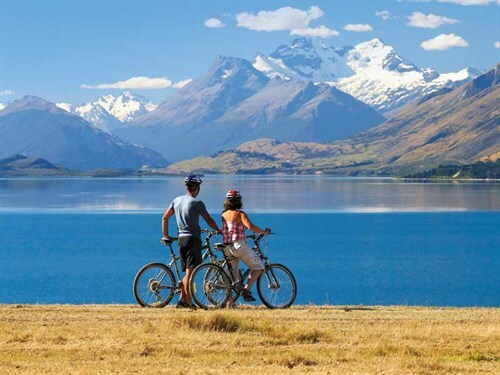 The Queenstown Trail comprises around 100 kilometres of spectacular cycle trail within the Wakatipu Basin of the Otago region. It meanders through the Gibbston wine area and the historic gold-mining town of Arrowtown, taking in the stunning landscapes of Lake Hayes, Frankton, and Queenstown. Riders will enjoy discovering hidden ruins, amazing architecture, and historic bridges. The West Coast Wilderness Trail is a series of tracks, originally carved by pioneering gold rush miners and set in the middle of the West Coast of the Southern Alps. The tracks showcase extensive water races, logging tramways, and historic railway lines as they take in outstanding landscapes of dense rainforest, glacial rivers, lakes, and wetlands.